The team at SlipAlert LLP is working on some new videos. As well as an exciting new promotional video, we will be launching a set of video guides on how to get the most from your SlipAlert. These videos will cover topics including: caring for your SlipAlert, Cleaning and Maintenance, purchasing new floors , and site specific slip prevention. If you'd like to be notified when these new videos are available then please contact us. More businesses are finding they can reduce slipping accidents. SlipAlert users report significant reductions in slipping accidents and massive reductions in slip claims. 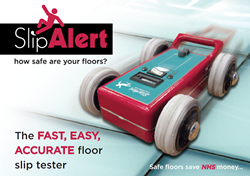 SlipAlert users who regularly test floors find SlipAlert benefits their business and reduces accidents. 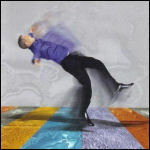 To reduce slipping accidents / claims in your business contact Andrew. How do you select the best anti-slip coatings? Many people ask us how to choose the best anti-slip coatings or treatments. The key is to know more about your floor, how it is used, and how it is cleaned and maintained. Too many anti-slip coatings are selected only based upon data from the manufacturer. You should always test floors before and after an anti-slip coating is applied. You should also test the durability of the anti-slip coating because on some surfaces the effects could wear off and some coatings will not prevent a build up of contamination that may have been the cause of the slip risk in the first place. If you'd like to know more about anti-slip coatings then please contact Andrew. How do you test anti-slip shoes? We have recently been testing a number of anti-slip shoes and overshoes. Fascinating differences. Some anti-slip shoes work well in the wet and some do not. Some work very well with other contaminants and some do not. If you'd like to know more about how to select the most suitable anti-slip shoes then please contact us. We were asked to test the new 4Earth anti-slip gloss coating. and the 4Earth mineral tile treatment. 4Earth supply anti-slip coatings, anti-slip cleaning products, the new anti-slip gloss coating and the mineral tile treatment. The results from the anti-slip gloss coating were impressive. Please contact 4Earth for product details or contact Andrew for more information about anti-slip coatings. 4Earth also offer an exciting new "anti-slip" insurance service with discounted insurance and ongoing assistance to ensure maximum slip prevention. Contact 4Earth for details. How many slipping incidents do you have in your business? How many slips is acceptable? How can you make your floors safer? Please contact us. When did you last check the sliders on your SlipAlert? It is important to monitor slip risk to reduce the chances of slipping accidents, slipping injuries or slip related claims. If you'd like help with training staff, or guides to slip prevention in your business then please contact Andrew. Malcolm has designed special bumpers for the SlipAlert to avoid damage if it collides with a wall. The first chance to see the new special edition bumper car was at FeRFA. You can see it here. Andrew submitted a paper to the slip conference in Japan. Download a copy here. It is now even easier to monitor and maintain safe floors. Our easy lease options from just £95 per month make it easier than ever to manage slip risks in your business. Easy lease options. Please contact Jenny for more information. The long awaited new design for our wheely case is complete. Every new SlipAlert sold in 2013 will include the new wheely case free of charge. Already our customers are telling us how much they like the new case. Even Andrew is using it for site visits. See the new wheely case. We offer slip prevention training to Health & Safety Managers, EHO's, Cleaning Staff, and anyone involved in floor safety specification or management of slip prevention. Click for workshop topics. New open course dates in November 2013. Book now. One of our pharmaceutical customers asked us to test their floors with standard rubber slider and also with a custom made Shoes For Crews (SFC) slider. The results were extraordinary. SFC are renowned for the supply of top quality anti-slip shoes, but even they did not know how well their shoes would perform on slippery floors coated with substances like IMS or Glycol used on these lab floors. In every test on every surface, the SFC shoes outperformed the standard rubber proving that staff are far safer now that they routinely wear SFC shoes in the labs. In many cases the risk was reduced by over 1000 fold. If you would like to test the effects of SFC or other anti-slip shoes on your floors then please contact us. We are pleased to announce that the new "Pocket Guide" is now complete and being printed ready for release in November. It is already being described as "ground-breaking" and "an invaluable tool for every flooring company" Order your free copy now. Need an independent slip test? SlipAlert now appears in the British Standard. BS8204 part 6 (Annex-B) describes how SlipAlert should be used for measuring and monitoring the slip risk of floors. SlipAlert and the Pendulum are the only slip test devices described in British Standards. More on BS8204. The December edition of Contract Flooring Journal includes a controversial article on roughness by Andrew Stewart. We would welcome your comments on the roughness debate. Read the CFJ article here. SlipAlert has been shown to give excellent correlation with the Pendulum and is much faster, saving you time an money. Combined tests by HSE, SlipAlert LLP and independent test houses over hundreds of floors give a 0.94 R2 correlation with the Pendulum. Find out how fast slip testing can benefit you. Slips Won't Fall - roughness to blame? What can you do in just 5 seconds? Usain Bolt can run about 50m, most people can read about 20 words, or type 5 words, or speak about 15 words. You can accurately measure the slip risk of any floor in under 5 seconds. SlipAlert LLP is compiling a list of all credible slip test machines. We'd welcome your comments on test machines you have experienced. We'd like your help to prove that SlipAlert is easy and consistent. We'd like volunteers to take part in our repeatability and reproducibility tests. Please contact SlipAlert if you'd like to volunteer. Read the latest paper by Dr M Bailey. For a list of papers on slip risk, slip resistance and effective slip measurement click here. The latest HSE video of SlipAlert in action clearly shows the difference between SlipAlert in wet and dry conditions. click on the image to watch SlipAlert in action. If you'd like to see the new FERFA guide to slip safety on resin floors, visit the FERFA website or contact us. Got a floor? Get a SlipAlert! You can wait till your floors become slippery, wait till things go wrong, wait till someone is injured in a slipping accident. You can wait and worry... or you can be proactive. SlipAlert appeared in the May edition of flooring. For a text version of the article click here. SlipAlert also fetaured in February with an article on slip resistance mattres and measures. Release. When SlipAlert stops read SlipAlert Test Value (STV). Download the latest SlipAlert user guide. Thousands die each year as a direct result of slipping and tripping accidents. In addition, many elderly people who fall die within one year of the accident. SlipAlert saves lives and keeps you safe. Click here to read our easy-guide to floor safety. Many serious accidents start with a fall. A large number of industrial accidents in which people injure themselves in machinary start because of a fall. When people slip they naturally put their hand out to prevent the fall and this results in many serious industrial accidents. HSE statistics on major accidents caused by slipping. Our new slip prevention package and monthly slip prevention programmes guarantee to half the number of serious slip injuries in your business. Slip Prevention details. Are you going to the Olympics or Paralympics in London this year? Let us know if you encouter any slippery floors on yoru journey. Good luck to all the athletes and especially the British teams. Watch the latest SlipAlert video. Now also on Youtube. We also want your feedback and ideas for training videos to help prvent slip injuries. Click here to see our plans and offer your ideas. The brand new Pocket Guide to Slip Prevention is available from November 2011. It is packed with great ideas to reduce slip injuries in your business. Order your free copy now. Slip testing can save the NHS money. You can avoid slip headaches like new floors being slippery or slips caused by poor cleaning. Our NHS booklet is helpful for all those involved in hospiatl safety, patient safety, NHS Trust health & safety, care Homes. Order your free copy now. Still using roughness the fake slip test ? Increasingly around the world, SlipAlert is used in court for legal evidence on the slip risk of the floor. In the UK, until now, judges have favoured the Pendulum. SlipAlert has british Standard, it delivers more consistent results that can quickly be checked. It helps building managers provide evidence of testing and monitoring for slip risk and to provide trend analysis. If you have used SlipAlert evidence in UK courts, please contact us. SlipAlert is fast, easy, accurate and consistent. You can accurately measure slip risk of your floors in under 5 seconds. Its that time of year. The great SlipAlert snowman competition. See photos of great snowmen, from the first SlipAlert snowman built by Jenny in 2007 to the amazing winning snowman from last year built by Steve Purser in Leeds. Enter your snowman. 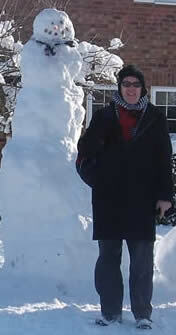 Got a taller snowman photo? It's been cold and snowy across the country. Hopefully we are heading for a thaw and warmer weather. A&E report more broken bones caused by slips and accidents as the thaw sets in. Slips happen in the snow, and as people enter building with snowy wet shoes. Please enjoy the snow but wrap up well and take extra care to avoid slip accidents. Send us pictures of your tall happy snowmen. For a list of papers on slip risk, slip resistance and effective slip measurement click here. Weekly slip testing will give you invaluable data about the performance of your floors and the performance of your cleaning. Click on the graph for more information.